One of the themes I like to employ when showing people the wonders of the City of David’s ancient water systems (yes, plural — perhaps even more so now!) is the many mysteries surrounding those spaces: unanswered questions about how, when and why some of the elements were constructed — and how they even worked! The new interpretation highlighted here seeks to answer some of the many nagging questions about the various water installations and how they related to each other, both in time and function. The Siloam Tunnel and the inscription incised on its rock wall have, since the inscription’s discovery in 1880, been considered the work of King Hezekiah, and have served as a chronological anchor for the late Iron Age in Judah. The authors’ recent excavations in the City of David near the Gihon Spring and the northern end of the tunnel have yielded new archaeological data that bear on the date of the construction of the tunnel and the incising of the inscription. Their evaluation of these data suggests that the completion of the tunnel should be set back several decades to at least the early part of the 8th century BCE, which would mean that the tunnel predates Hezekiah’s reign. City of David Walls & Water Systems. Source:BAR, 1999. Note: What Reich and Shukron were calling the “Pool Tower” in 1999 was re-interprted a few years ago as a fortified east-west corridor leading to the Rock-Cut Pool. In their article, Reich and Shukron actually expand the standard nomenclature referring to the various parts of the water system. On a graphic from several years ago (again, from BAR), below, I have highlighted in color the passages the authors are focussing on, and re-labelled certain elements with the new terms (new to me, at least). Also, we will embrace (for the moment) the authors’ term “Siloam Tunnel” instead of “Hezekiah’s”, for reasons that will become obvious. The Rock-Cut Pool, its lower “Round Chamber”, and Channels II and III all date to the Middle Bronze Age (MB), as does the stepped and curved upper tunnel — “Warren’s Shaft” — system. The Gihon Spring has always been there, of course! Originally, the Gihon waters flowed south through Channel II and were shunted in a controlled fashion into the the Round Chamber, the deepest part (the northeast corner) of the Rock-Cut Pool. The pool could be accessed (during a time of war or siege, for example) from inside the city, underground, via the stepped, curved tunnel which passed beneath the city walls, and then through the fortified corridor flanking the pool on the north. This system was still in operation in Iron Age 2, when the tunnel was started. (The authors also apparently posit (and maybe always did) a “Channel I” (not shown here) which looks to have flowed from the Gihon out along the surface of the slope and into the Kidron Valley. Or have traces of this actually been found?) The constructions adjacent to the pool also belong to the MB: The fortified corridor (ex-“Pool Tower”) and the Spring Tower, whose western wall exactly overlies the spring itself. Now, fast-forward some 1,000 years. The authors point out that the water source and its reservoir were always, from the MB, protected by the city’s outer, eastern fortifications, and that these were still functional (as rebuilt, surely) in Iron Age II, the time of the Kings of Judah. Their main point: You don’t need a “Hezekiah’s Tunnel” to protect the water from the Assyrian seige in 701 BC (per the usual narrative) and, indeed, the specific preparations mentioned in the Bible (2 Chr. 34:3-4) involved concealing Jerusalem’s outlying water sources. Moreover, archaeology has shown that well before Hezekiah enclosed Jerusalem’s western hill within a city wall, an un-fortified suburb had grown up there, and this could have spurred the tunnel project, which conveyed water to the western side of the City of David. This brings us to Reich & Shukron’s most striking new proposal: a re-dating of the Siloam Tunnel – and therefore of the famous Siloam Inscription – to the late 9th/early 8th century BC, thus breaking the longstanding association of both with the reign of King Hezekiah almost a century later. Their basis for this new view is two-fold. First, they have arrived at a particular understanding of how the tunnel was built: that the northern team of diggers did not start from the spring itself but rather from the bottom of the Round Chamber, creating Tunnel IV. This is the only way it could have been done, they say, because of the existing higher water level in the system: in short, the tunnelers would have drowned. Then, after the joining of the still-dry northern and southern segments (the southern tunnelers began first, the authors say), the northern team cut the short (12m) Tunnel VI, from the middle of Tunnel IV back to the spring; the direction of the cutting is clearly shown by the pick-marks. That “join”, then, is when “the water flowed from the spring towards the [Siloam] pool”, as the famous inscription says. As a consequence, the water level in the system was lowered and Channels II and III (lying at a higher level than the tunnel) would have gone out of service. Given that scenario of the tunnel’s creation, the status of the Rock-Cut Pool becomes crucial. The pool’s excavators, Reich & Shukron, state that they found an Iron Age residence built into the pool and that the latest pottery found in the fill sealed beneath its floor was from the late 9th century. Allowing for various possible configurations of the pool space (as well as the disturbance of the bottom-most material by the 1909-11 Parker expedition — see below), they remain convinced that the Rock-Cut Pool — the starting point of the northern cutting of the Siloam Tunnel, in their opinion — was out of service and indeed filled with debris by about 800 BC. By the way, I found especially interesting the background given in the article on the explorations of the infamous Montague Parker expedition of 1909-11, whose members actually first discovered and explored some of these spaces. Following the already-known Siloam Tunnel from its Gihon source, they discovered and traversed Tunnel IV and by this means reached the deepest part of the Rock-cut Pool, at the pool’s floor level. This space they partially excavated from the bottom, supporting the unexcavated material overhead with wooden framing, and dubbed it the “Round Chamber” (a term Reich & Shukron have now revived). Incidentally, this space still existed and was seen by Israeli archaeologists in the 1970s; it later collapsed, and the wooden elements were found in Reich & Shukron’s excavation of the pool, digging from above. The Parker expedition’s only real legitimacy was provided by the Dominican scholar Fr. Louis Hughes Vincent of Jerusalem’s Ecole Biblique, persuaded by concerned outsiders to join what had otherwise become known as a rather scandalous treasure hunt; Vincent, with his characteristic thoroughness and precision, succeeded in documenting these spaces for posterity, despite the frivilous nature of the larger enterprise. 2 Chr. 32:30, however, seems much more explicit, containing two specific place-names — It was Hezekiah who stopped the upper outlet of the waters of Gihon and directed them to the west side of the City of David (NASB) — and here Reich & Shukron, in my estimation, try to employ a false argument: They focus on the supposed building of the tunnel, according to the traditional view, in anticipation of the Assyrian invasion of 701 BC, arguing that the short time-frame provided by any warning of the coming invasion, a matter of weeks to a few months, was not long enough to construct the existing tunnel; it was cut through hard dolomitic limestone, they explain, and would have taken several years to hew out. However, the Assyrian connection is one they had already dealt with — and dismissed! And, indeed, the Bible itself does not make or require any such explicit linkage, the traditional explanation notwithstanding; thus, “Hezekiah’s Tunnel” of 2 Chr. 32:30 could have been constructed at any time during that king’s reign. 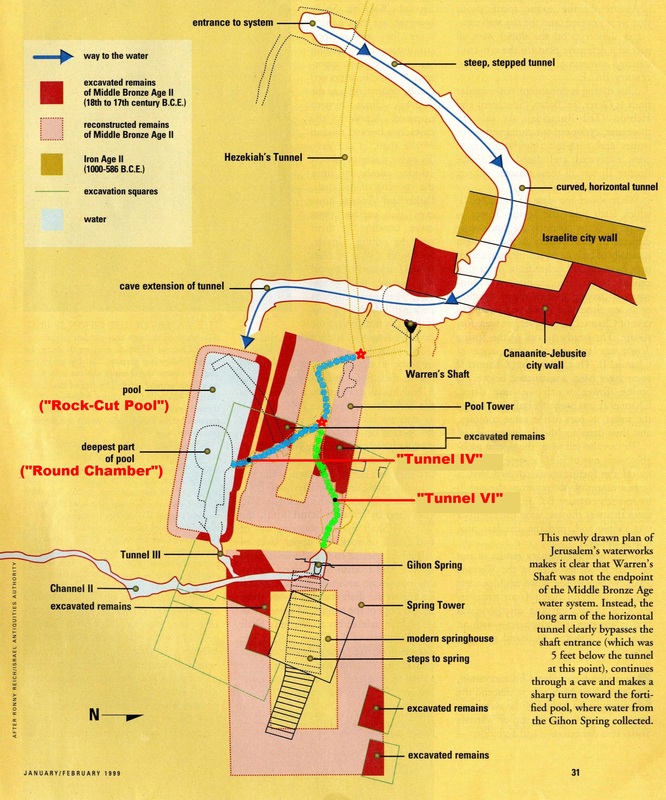 Again, as the authors demonstrate — and I tend to concur, you don’t “need” a Siloam Tunnel to protect the Gihon waters from the Assyrians (or in any period, really, because of the overlying MB fortifications and access from within the city), nor do you “need” the Assyrians as a rationale for digging the tunnel (because of the 8th century expansion of settlement to the western hill). As for the specific verse in question, the authors make no real attempt to relate the project it decribes to anything that has been found (or not found!) on the ground. The Rock-Cut Pool clearly has two different floor levels, suggesting that its function changed over time. Did it? And, if so, how? At its higher, original floor level, where was the water coming from that filled it? And, at the pool’s later, lowest floor level, the Gihon waters filled only the one cut-down corner of this remarkably large, deep installation — and to a depth of only one meter! 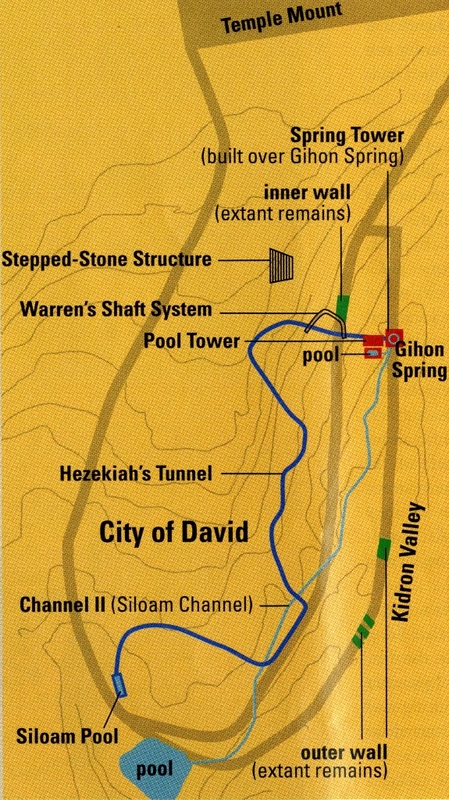 The plan of the Gihon area shows that (1) Tunnel IV heads straight for the chamber at the base of Warren’s Shaft — a connection that was later walled up and plastered over — and (2) from that junction the Siloam Tunnel proper goes off at a 90-degree angle. This makes me question the original function of Tunnel IV. Reich & Shukron’s earlier work around the head of “Warren’s Shaft” suggests that the floor of the MB upper tunnel was for some reason cut down to a lower level about the 8th century BC, but there is no satisfactory explanation: What were those ancient engineers trying to achieve? In the course of this project, they broke through to the natural karstic chimney we know as “Warren’s Shaft”, rendering that upper tunnel system useless, and simply stopped their work at that spot. Related to this (although it’s still debated), “Warren’s Shaft” was seemingly never used to draw water from the chamber at it’s base. Yet, someone went to the trouble of digging a tunnel (the northern end of Tunnel IV?) into that space. Why? Were the waters of Gihon channelled there? Was it perhaps a short-lived experiment? Why does the initial stretch of Hezekiah’s Tunnel head west for a considerable distance, in a more or less straight line across the City of David ridge, and then make a sweeping turn to the south? It suggests to me that the project somehow changed mid-course — engineering on the fly. I could go on — Why is the southern end of the Siloam Tunnel so impossibly tall? — but the point is made: There’s too much we still don’t know or can adequately explain. Until further notice, “Hezekiah’s Tunnel” remains in my personal onomasticon. This entry was posted in Archaeology, City of David, Hezekiah's Tunnel, Jerusalem Antiquities and tagged Archaeology, City of David, Eli Shukron, Hezekiah's Tunnel, Hugh-Louis Vincent, Jerusalem, Parker Expedition, Ronny Reich, Siloam Inscription. Bookmark the permalink. A great overview, Tom. Thanks so much! Very thought-provoking & informative. Thank you, Tom! 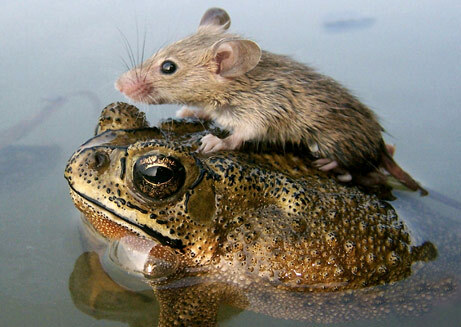 Very careful and thoughtful!! Thanks. Found your article very interesting, I just stumbled upon it by accident, when it was mentioned in Ferrel Jenkins Blog on Word Press. I love anything and everything about Israel, and the History of The city of Jerusalem, and the people living in Biblical times and especially the Temples..I live so far away in Colorado, and shall probably never, due to the troubles in that area see it for myself. I am so pleased to find your articles and pictures .Thank you ever so much.